Have a question about a partition action? Not sure how to proceed when you’ve received a partition action? This can be a complicated part of real estate law, but it’s one that the Law Office of Diron Rutty deals with every day on behalf of our clients. Many of the clients who contact our office haven’t yet received a partition action and want to know what their options are, or they have a partition action and want to know if they can fight it. 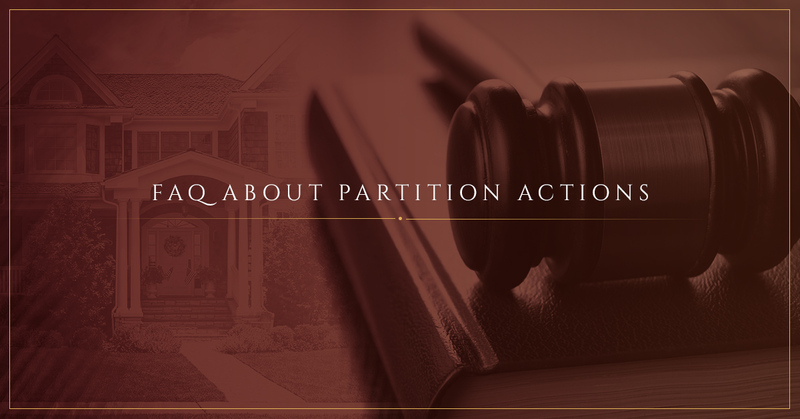 Here are some of the Frequently Asked Questions (FAQ) that we receive about partition actions and some helpful information that might answer the questions that you have, too. Our Bronx real estate lawyer recommends that you always seek legal help when dealing with a partition action. These actions are a settlement agreement between two or more parties who own a property. For instance, if you and your siblings all own property together but you can’t decide the best course of action for the property, a partition action will dictate what happens. What is a voluntary partition vs. a judicial partition? A voluntary partition means the co-owners of the property have reached a resolution of what to do with the property themselves and are voluntarily complying with the agreement. A judicial partition means that the co-owners have not been able to reach an agreement and the courts have had to step in. The partition action is a legal agreement and can be enforced through the courts. Should I pursue mediation first? Our Bronx real estate lawyer recommends that you always attempt mediation first unless there are circumstances that prevent you from doing so. That’s because mediation can often be less expensive and provide better outcomes for both parties than a partition action that comes down through the courts. If the court has to decide the action, you may find you aren’t happy with the outcome and won’t have much recourse. Our office can help set up a mediation appointment between all of the parties involved. Are there any downsides to pursuing a partition action? There certainly can be. If the courts force you to sell the property at an auction, you could end up getting much less for the property than it’s worth. Waiting for the action to be resolved could end up hurting your credit score, too. If you are ordered to buy out the other parties, you’ll need to make sure you can come up with that funding or else you may end up losing the property. A real estate lawyer can discuss with you all of the possibilities and make sure you know the implications of pursuing a partition action. What’s the common outcome of a partition action? The most common outcome is that a judge requires the co-owners to sell the property and divide the revenue. It’s likely that your case could end up with the same outcome, although there are many other possibilities including one party buying out the others or a division of the property that results in sole ownership of a part instead of the whole. What properties are covered by partition actions? All properties that have more than one owner can be affected by a partition action. This includes residential and commercial properties. Owners don’t have to have equal ownership, either; someone with a smaller share of the property can file for a partition action against the majority owner. The more documentation that you can provide about the property, your ownership of it, and the expenses related to it, the better off your case will be. This is good for the initial consultation, too, because we can provide you with better information that can help you determine whether or not you are ready to pursue legal action. If you aren’t sure about what to bring, just get in touch with us and we’ll make sure you have what you need. Are you ready to pursue a partition action on a property that you co-own with one or more parties? Then it’s time to get in touch with an experienced real estate lawyer here in the Bronx. Give the Law Office of Diron Rutty a call or contact us through our website to schedule your free consultation.